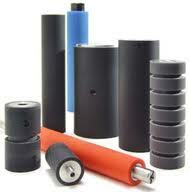 we engaged in manufacturing and supply of all kind of rubber product and rubber lining works. Our product range is including Rubber Roller which is used in various industries like paper, Textile, conveyor system and Hot application. These Rubber Roller is available with us in different ranges and also we do manufacturing as the requirement and drawing provided by our clients.